Every Spring the SES PTSA approves a budget for the upcoming school year. The SES PTSA budget for the 2017-18 school year is approximately $100,000. You can read the full budget here. The chart below shows the membership-approved expenses for the 2017-18 school year. The Sustainability Program (at $36,500) is the #1 expense and includes programs at school (primarily benefiting the K-5 student population) and field study programs for the Middle School. The Go Fund support (at $17,500) is the second largest budget item and supports students going on overnight trips from 5th to 8th grades. The School Services Grant ($16,250) is funding raised through the Back to School Ask and goes towards equipment and supplies for classrooms, PE, Library, Science, Art and more. Music and Art support is spread across the grades, with the majority ($15,400 of a total of $18,900) going towards music and art enrichment in the K-5 grades. 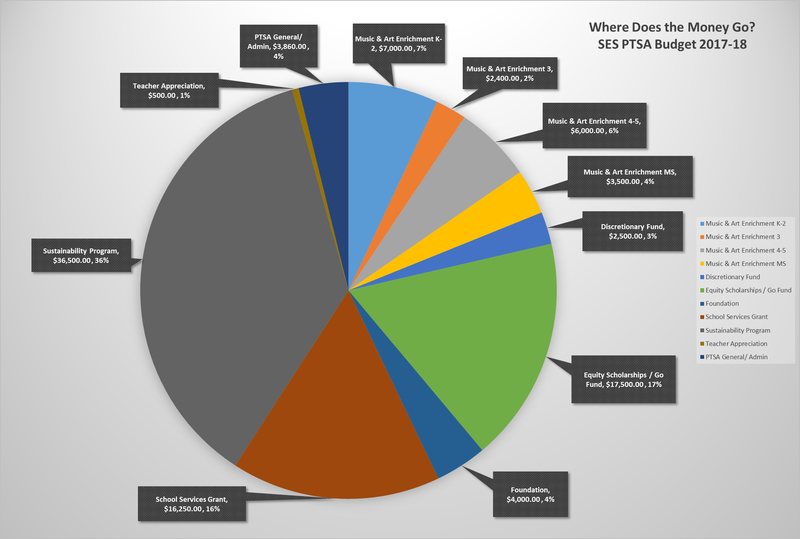 The SES PTSA spends about $3,400 each year on administrative costs such as Oregon PTA and National PTA membership and contribution expenses.